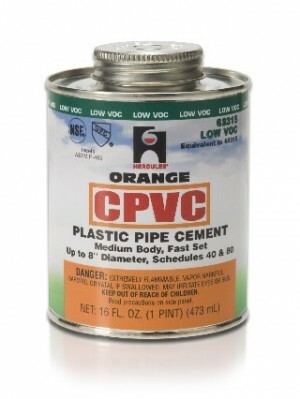 Can I Use CPVC Cement on PVC? Can I use CPVC cement on PVC is often asked by Do It Yourselfers on a number of plumbing help forums everyday and the short answer is NO! Just this morning I found an article to the contrary on a popular Do It Yourself website and it compelled me to write this article. 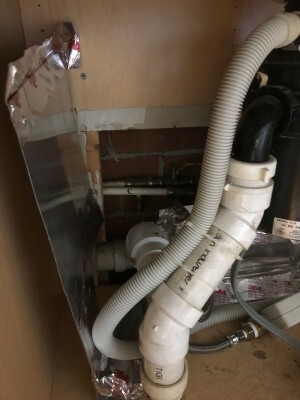 Hopefully my writing this will save some people the frustration and expense of having their Do It Yourself pipe project fall apart and require being redone. It is a pity that some of these large sites do not monitor their content for accuracy. The process of joining plastic pipe with cement is actually a solvent welding process. A variety of chemical cleaners, primers, and cements prepare the joint cleaning and softening the plastic pipe getting it ready for the final step where the cement makes the plastic on the surface where the two pieces being joined meet, turn to a liquid state momentarily, while you assemble the joint with a twisting motion, then the plastic re-hardens. This process only happens correctly when the correct chemistry is used for the process and if the correct chemistry is not used the joint will remain weak and very likely to fail in the future. Use only the chemicals, which are compatible with the materials you are joining and use them in accordance with the directions for that product taking all the required steps to ensure proper bonding occurs. When the Pipes are properly joined together with a solvent weld the joint will be as strong as the material itself. PVC pipe can only be joined with cement to PVC pipe in most applications using the appropriate cements, cleaners, and primers. In most cases when joining PVC to another material a mechanical joint such as a threaded joint, flexible coupling, or, shielded coupling should be used. There are some Transition Cements that may be used to bond two different materials such as one which allows PVC and ABS pipe to be joined together but there are often limitations with these products such as one where it is not allowed to be used in applications involving pressure in the pipe. Many of the state, county and local codes in use across the country may also have prohibitions on the use of transition cements. Before using Transition Cement check with your local building inspector to determine if Transition Cement is allowed in your area. There are Multi-Purpose Cements, which can be used on PVC, CPVC, and ABS however, they cannot be used to join dissimilar materials such as PVC to ABS. They can only be used in conjunction with appropriate cleaners and primers in accordance with the directions for the product. 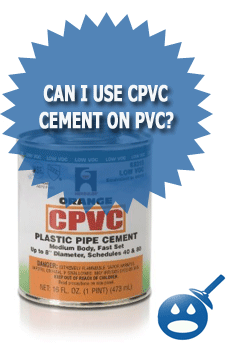 Multi-Purpose Cements are the only cement which can be used on both CPVC and PVC pipe. With cements used for joining plastic pipes the major plumbing codes require the cements to meet the specifications of the American Society for Testing and Materials (ASTM). The standard used for CPVC is ASTM F493, the standard used for ABS is ASTM 2235, and the standard for PVC is ASTM D2564, the ABS/PVC transition cement meets standard ASTM D3138, which specifically covers the joining of PVC and ABS Pipes only. Only Multi-Purpose Cement meets the requirements of ASTM F493, ASTM 2235, and ASTM D2564 allowing it to be used on joining CPVC to CPVC, PVC to PVC, and ABS to ABS. CPVC Cement meets the requirements of ASTM F493 but does not met the requirements of ASTM D2564 so the answer is CPVC Cement cannot be used on PVC. Good way of telling, and fastidious paragraph to take information about my presentation subject, which i am going to convey in university.